When Bill Montgomery and Chuck Dicus were high school quarterbacks in the Dallas, Texas, area, in the 1960s, they ended up signing with Arkansas through the efforts of a Razorback assistant coach. The coach’s name was Johnny Majors, who had grown up in the Monteagle Mountain area not far from Chattanooga before going on to star for the Vols. By the 1968 season, the future Tennessee coach was enjoying his first season as head coach at Iowa State, but some of the players he recruited – such as Mr.
Montgomery and Mr. Dicus – led 9-1 Arkansas to a berth in the Sugar Bowl. It was not the only Chattanooga area connection to that memorable New Year’s Day game of 50 years ago. The Arkansas head coach was Frank Broyles, who had played at Georgia Tech with Baylor School graduates Eddie Prokop and Bill Healy, Notre Dame’s Pat McHugh and City’s Jim Henry. He also helped coach such other Baylor grads as Leon Hardeman and Billy Teas at Tech. 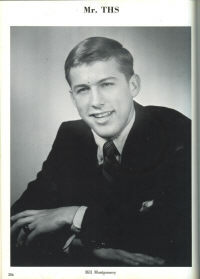 He would even send his own son, Jack, to Baylor in 1962-63. The 9th-ranked Razorbacks’ opponent in that Sugar Bowl was also a team with a little bit of a following around the Chattanooga area -- the 8-0-2 and fourth-ranked Georgia Bulldogs, who had won the SEC championship. And one of the Bulldog players was a Baylor grad as well – standout linebacker “Happy” Dicks, whose family lived for years at a home by Mississippi and Young avenues in North Chattanooga/Riverview. Georgia had been favored, but the day would belong to Arkansas in a 16-2 victory in what was largely a defensive contest. 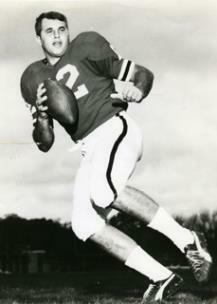 It had been billed as a game featuring Arkansas’ offense against Georgia’s stout defense led by all-Americans and future Miami Dolphin players Bill Stanfill and Jake Scott. Another standout defensive player was Billy Payne, who, like coach Broyles, would later take on an active leadership role with the Masters golf tournament and Augusta National Golf Club after he helped bring the 1996 Olympics to Atlanta. It was a bad day for the Southeastern Conference that Wednesday, as a good Tennessee team under coach Doug Dickey – another former Arkansas assistant to Frank Broyles – was trounced by Texas and its new wishbone offense at the exact time. On that day, I was a 9-year-old Georgia fan – primarily because my father, Dr. Wayne Shearer, had attended school there – and I remember watching with sadness Georgia’s unfortunate loss and frustrating day. We also had a black and white TV sitting next to our color one in our den of our Valleybrook home, and the storyline there was even worse for Tennessee, as they lost 36-13. Since that Sugar Bowl game was one of the first college football games I was old enough to follow closely, and because that afternoon is still vivid in my mind, I thought it might be fun to try and track down some former players from both teams. I wanted to get their memories of that game and their perspective looking back now. Mike Cavan, the sophomore quarterback from Thomaston, Ga., was probably my hero on that Georgia team, and I talked to him, as I did to scrappy defensive lineman Steve Greer and wide receiver Charles “Charley” Whittemore. All three were actually on the Georgia varsity coaching staff at some point when I tried to follow my own dreams perhaps birthed during that 1968 season and walk on the Bulldog team in 1978 and ’79. I had the most contact with coach Whittemore and his encouraging and even-tempered manner when I was trying to play receiver in the spring of 1979 and when I briefly went through winter workouts in 1980. But since that Sugar Bowl outcome also made me a little bit of an Arkansas fan, players like Bill Montgomery and Chuck Dicus became among my favorite college players for a couple of subsequent seasons as well. With the help of the Arkansas communications office, I was able to track those two down, too, and they kindly reminisced about that game of long ago. I had hoped to talk with Happy Dicks due to his Chattanooga connections, but I was unable to reach him following a call to his home now in Athens, where he went on to become a neurosurgeon. Although the Sugar Bowl in subsequent decades has been played at night, and for a long time was televised on ABC – with even Frank Broyles later providing some commentary – the one in 1969 began in the early afternoon on NBC. The commentators were the late Charlie Jones, who received a law degree from Arkansas, and the late former NFL quarterback George Ratterman. The crowd on hand was around 82,000, much more than the crowds of 40,000-60,000 Georgia and Arkansas usually played in front of during that time period. The old Tulane Stadium had opened in 1926 on the school campus, which was the former site of a plantation in New Orleans where granulated sugar had first been produced from sugar cane. The stadium would last host a Sugar Bowl after the 1974 season before the opening of the Louisiana Superdome, and would be torn down in late 1979 and early 1980. Although an obvious skill level is apparent on both teams in looking at the old grainy films accessible in a four-part highlight video of the game found on YouTube and apparently put together by the city of New Orleans or Sugar Bowl officials -- and both teams had the same helmet logos as today -- much was obviously different. The pylons were not high-tech, and were simply flags. And the flags of the referees were red, not yellow. And both coaches Vince Dooley of Georgia and coach Broyles were known during that time period for being shown on TV wearing ties and taking quick drags on cigarettes – apparently to calm their nerves. Of course, coach Dooley is still going strong at 86, and coach Broyles lived to 92. Also, no players from either team decided to skip the bowl to keep from getting hurt and potentially miss out on millions of dollars in the NFL draft. 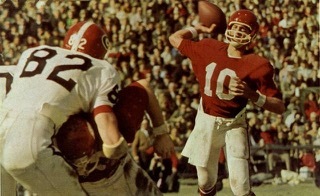 Both Georgia and Arkansas teams were also all white at that time, although the times were changing quickly. Arkansas, which was not quite as much in the Deep South, did have a black freshman walk-on in 1965 named Darrell Brown, and Hiram McBeth would try out in the spring of 1969 and Jon Richardson arrived on scholarship in the fall of 1969. Georgia’s first five black players – including future stars Horace King and Richard Appleby – arrived as freshmen in 1971. 1968 had been an eventful year in several realms with unfortunate assassinations, the buildup in the Vietnam War, protests, and such inspiring moments as the Apollo 8 circling of the moon on Christmas Eve and great new music. But it was still very much football as usual in this year when O.J. Simpson of Southern Cal won the Heisman Trophy. When the 1969 Sugar Bowl kicked off, the first quarter proved to be sour, not sweet, for both teams. Georgia quarterback Cavan lost three fumbles and had an interception, Razorback quarterback Montgomery lost a fumble and had an interception, and a missed field goal by Arkansas field goal kicker Bob White kept the game scoreless. But in the second quarter, the storyline would change. On the first play, Mr. Montgomery, who often rolled out to throw, hit Chuck Dicus on a 27-yard TD pass that resulted in a 7-0 Razorback lead. When Arkansas fielded the punt after later stopping Georgia, a clipping penalty put the ball at the Georgia 4. A great tackle by David McKnight of Georgia on a run attempt by Bill Burnett resulted in a safety to make the score 7-2. (In those days, the opposing team punted from its 20-yard line, and did not kick off as is done today). Later in the quarter, Arkansas kicker White made a 34-yard field goal to put the Razorbacks up 10-2. Georgia did get the ball back and drove down the field before the end of the half, but Bulldog kicker Jim McCullough missed a 36 yarder as the clock expired. While Arkansas had the lead, the outcome was still very much in doubt. Georgia appeared to come out ready to play in the second half, when Billy Payne recovered a fumble on the kickoff on the Arkansas 20. The Dogs (who in later years would become the DAWGS) drove to about the 2, but a fumble by Georgia fullback Brad Johnson went out of the end zone for a touchback for Arkansas. Georgia’s golden opportunity to get back into the game had literally been fumbled away. But Georgia did get the ball back after holding Arkansas and benefiting from a bad Razorback punt. However, Bulldog kicker McCullough again missed a field goal, this time from 45 yards. In the fourth quarter, Arkansas’ White kicked a 24-yard field goal and, after the Razorbacks recovered the subsequent onside/squib kickoff, he tried again, but missed from 46 yards. 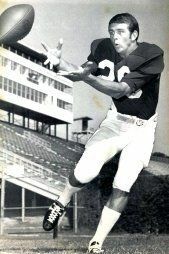 The now-deceased Donnie Hampton – the father of former UT-Chattanooga quarterback Brian Hampton – had substituted some with Mr. Cavan, but he threw an interception. Kicker White then got a chance to redeem himself with a 31-yard field goal. That put Arkansas up 16-2, and it would remain that way after a late Georgia pass was intercepted by the Hogs at the goal line. The key to the game to him was not before the contest, but during it when Georgia fumbled out of the end zone early in the third quarter after appearing to gain some momentum. As a result, what could have been a 10-9 Arkansas lead at that point and anybody’s game kept the Razorbacks comfortably ahead. As a result, Georgia could not catch up. 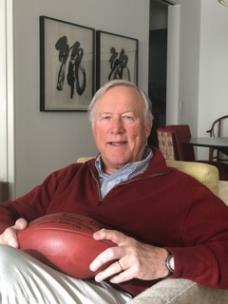 Coach Whittemore had come to Georgia as a running back from then-small Douglasville, Ga., High School outside Atlanta as the son of a Methodist minister and learned how to be a major college player after being redshirted in 1967, he said. Despite the bowl loss, he has special memories of that season’s team and especially quarterback Mike Cavan, who went on to become SEC sophomore of the year after leading a team with equal passing and running yardage. 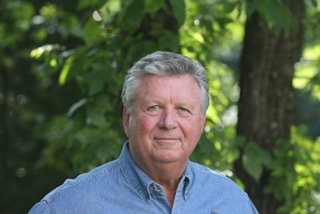 Mike Cavan had come to Georgia in 1967 from Robert E. Lee Institute in Thomaston, Ga. (now merged into Upson-Lee High School). 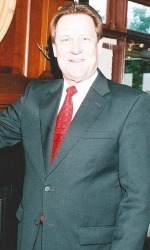 His father, former Georgia player Jim Cavan, coached him and his brothers in football and his sisters in girls basketball. He said he enjoyed being on that team as a younger player, when he enjoyed such highlights as leading the team back to a 10-10 tie at home against Houston after trailing 10-0. Mr. Scott -- a somewhat free spirit at the time who was known for reportedly riding his motorcycle up the large support ramps of the mid-century modern Coliseum, resulting in some fences being erected – left Georgia after his junior year of 1968. He went to play for the British Columbia Lions before playing for the Dolphins and Redskins of the NFL. Mr. Cavan said he was able to retire to Hawaii on his football income and investments and enjoys fishing there and still comes back for reunions. Another older player Mr. Cavan remembers looking up to was Billy Payne, who has become nationally known for his work with the Olympics and Augusta National. Mr. Cavan said even then he showed a lot of leadership as one of several key seniors on the team, pointing out that other players would bounce ideas off of him. Mr. Cavan and Mr. Greer remembered that the 50th reunion of the Georgia SEC champion team this year was special, and Mr. Whittemore said it was done in connection with the outstanding 1978 team. Mr. Cavan went on to become an assistant coach at Georgia and is known career wise as much for spending plenty of time in the tiny Middle Georgia town of Wrightsville in early 1980 before signing a running back named Herschel Walker. Mr. Cavan went on to be the head coach at Valdosta State, East Tennessee State and Southern Methodist University in Dallas, where fellow quarterback Bill Montgomery of Arkansas later settled. 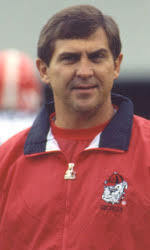 In 1992, while with East Tennessee, he led the Buccaneers to a come-from-behind win over the Chattanooga Mocs on the now-razed Chamberlain Field. In recent years, he has worked in the Georgia athletic department and now helps with football administration. Uniquely, exactly 50 years after his first bowl in New Orleans, he will be walking the sidelines of the Allstate Sugar Bowl with Georgia again when the Bulldogs play Arkansas’ old former rival, Texas. Of that first New Orleans bowl of long ago, he, like his teammates, still feels a little disappointment. For Arkansas players Chuck Dicus and Bill Montgomery, the 1969 Sugar Bowl was pleasantly unforgettable, although they remember it as being different from the offense of Arkansas versus the defense of Georgia. He said they were able to come up with a strategy of making short passes, and that helped. That was also due to the fact Mr. Dicus was able to catch them, as was fellow receiver Max Peacock. But it was Mr. Dicus who is more prominently remembered 50 years later, because his 12 catches, including the 27-yard TD reception, gave him the MVP award. That helped develop him into an all-American the next season and eventually helped him find a place in the very elite College Football Hall of Fame. He later played for San Diego and Pittsburgh in the NFL until a couple of future Steeler receivers and future Pro Football Hall of Famers named Lynn Swann and John Stallworth were drafted. He had actually been a quarterback at Garland High School in the Dallas area and had known Mr. Montgomery somewhat dating back to their junior high days, although both jokingly pointed out the other was the better-known young player. Mr. Dicus said he was a quick, but not fast, receiver at Arkansas who ran the 40-yard dash in about 4.5 seconds. He said he was helped greatly by the influence of receivers coach Richard Williamson, a former player at Alabama who went on to be the head coach at the University of Memphis. The accomplishments by the two and their teammates in 1968 helped set up a memorable game the next year on national TV to end the regular season when No. 1 Texas and No. 2 Arkansas met in the final weekend after No. 1 Ohio State was upset by Michigan. Arkansas led 14-0 before eventually losing a heartbreaker at home, 15-14. “We outplayed Texas for three quarters. Unfortunately there is the fourth quarter. But the ’68 team deserves a lot of credit for the success that happened in 1969,” said Mr. Dicus, who now lives in Fayetteville. Mr. Dicus -- who went on to work with coach Williamson at Memphis and since then has done such work as investments and stocks and bonds, real estate and heading up the Razorback Foundation -- said it is hard to believe 50 years have passed since that Sugar Bowl. He actually came somewhat full circle last year when he was inducted into the inaugural Sugar Bowl Hall of Fame class and went to the ceremonies. There with him was his old Arkansas coach, Johnny Majors, who had recruited him and was being inducted for his years as a player and coach. He remembers that the game was mostly a defensive struggle, and was reminded after looking at a film of the game in later years that it seemed like he and the Razorback offense had a lot of three and outs. “I believed then and believe now that Georgia team was the best defensive team I played in my three years at Arkansas. They were solid,” he said, adding that having a good field goal kicker in Bob White also helped. He particularly remembers getting hit hard in the second quarter by Bill Stanfill, the 1968 Outland Trophy winner who died in 2016, and injuring his shoulder in what was his only damaging injury in his three years of playing. Mr. Montgomery had come to Fayetteville from the Dallas area school of R.L. Turner High in Carrollton, where he was Mr. Turner High. His greatest attribute may have been winning, as the next two years he led Arkansas to 9-2 records. Georgia, meanwhile, finished 5-5-1 and 5-5 before rebounding with an outstanding team in 1971. One of those Arkansas losses, as mentioned, was to Texas on Dec. 6 in Fayetteville in an extremely high profile game attended by President Richard Nixon. “It was the most exhilarating game I ever played in and, for three quarters, the greatest game I ever played in. It was an amazing event,” he said, adding that when the game was scheduled a few months earlier, no one knew it would be the Nos. 1 and 2 teams playing. After the 1969 season, Arkansas received a Sugar Bowl invitation again and, like Georgia the year before, was this time the team with a bigger target on its back. Ole Miss under a quarterback by the name of Archie Manning – yes, Peyton’s and Eli’s father – played well despite its 7-3 record and won in an upset, 27-22, after jumping out to a 14-0 lead. After Mr. Montgomery finished at Arkansas, he was interested in playing in the NFL but was not drafted, although interest was shown from one Canadian team. 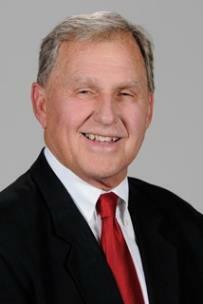 So he entered the workforce and enjoyed a successful career in financial services in Dallas before retiring. It has now been nearly a half-century since he put on the cardinal and white colors of the Razorbacks, but even today he has not forgotten the joy of playing. And now, more than ever, he still appreciates the rare opportunity he received. “When I was boy and my hero was Don Meredith (of SMU in Dallas), I dreamed of playing in the big games,” he said. “Ten years later at Arkansas those dreams came true. Playing for a national championship and two Sugar Bowls is the mountaintop of college football.